We spent the next day on a train outing from Kandersteg to Oberwald on the Furka Oberalp line before heading via Brig to Leuk. Here we caught the bus to Leukerbad. To say that the road to this resort is spectacular would be an understatement, with the road climbing hundreds of metres up hairpin bends, through tunnels and over bridges across the gorge. 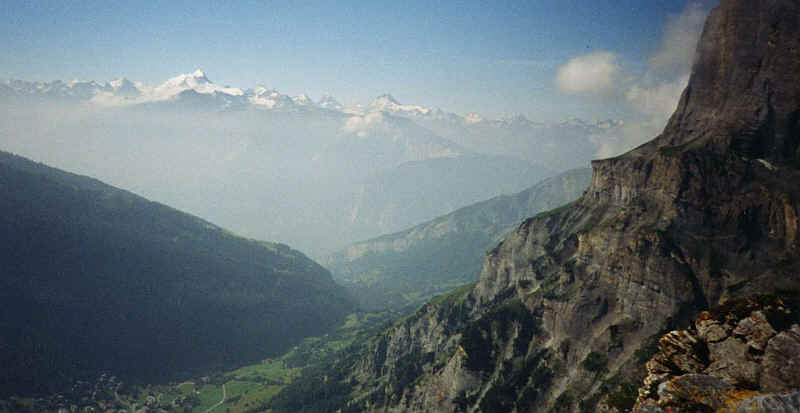 First impressions of Leukerbad were of its magnificent location with the Gemmiwand rock face towering above the town, but we were initially less enamoured of it as a town. It is a now largely a modern spa town with too much concrete and the inevitable large hotels. However, after a few days stay, we began to like it a little more. It is certainly a magnificent walking centre with cable cars giving easy access to the mountains. 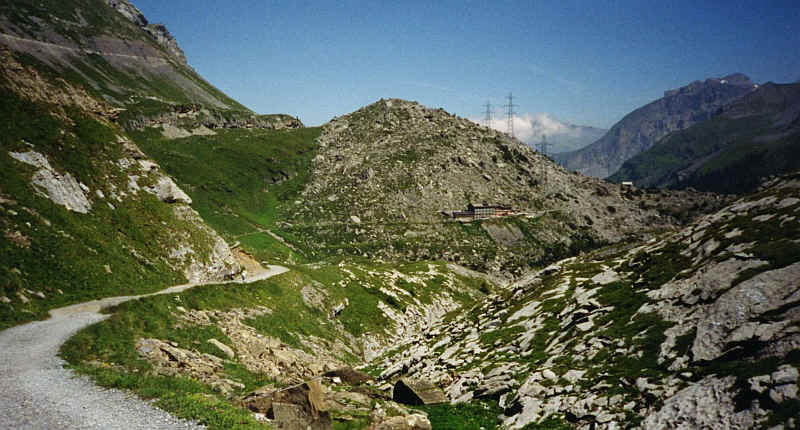 We set off to the Gemmi Pass by cable car. 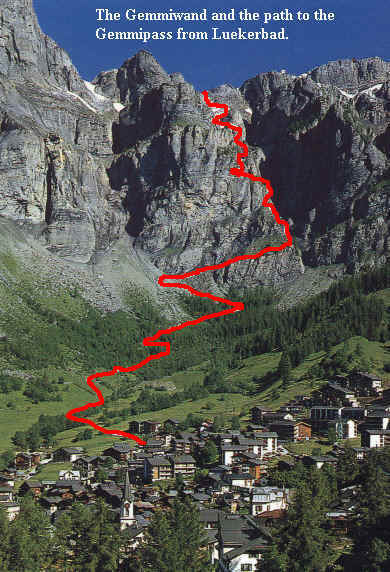 This rises from 1424m at Leukerbad to 2346m at the summit in one enormous rise. Unbelievably there is a footpath up the Gemmiwand, which has been hacked out of the almost sheer rock and used as a mule path for many years. It is protected by fencing and is apparently safe enough for children. It looks better to climb than to walk down though! 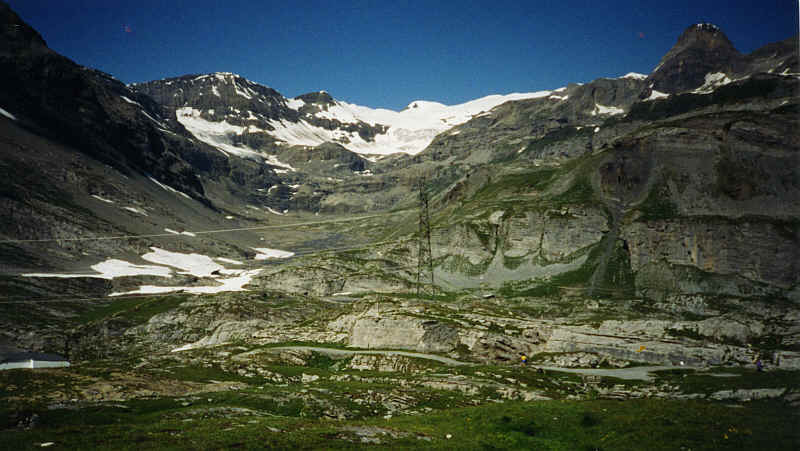 At the pass the whole of the Wildstrubel massive and its glaciers become visible together with the entire panorama of the Valais Alps south of the Rhone valley. 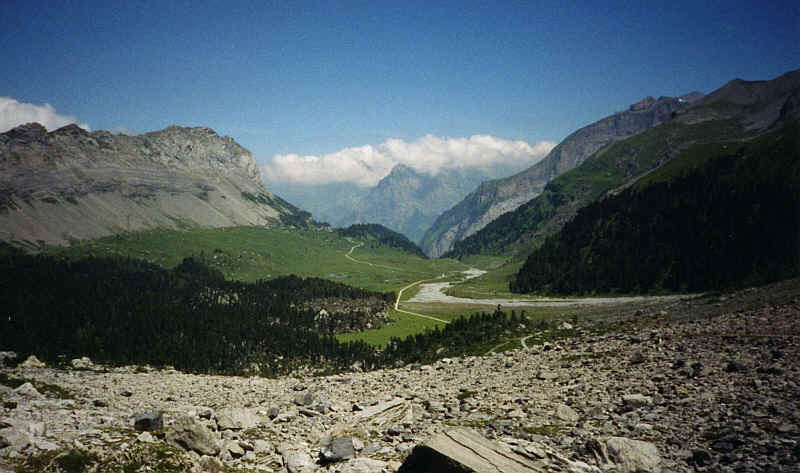 The Gemmi Pass path leads gently downhill the whole way from the summit to Sunnbuel just above Kandersteg, where there is another cable car into the Kander valley. 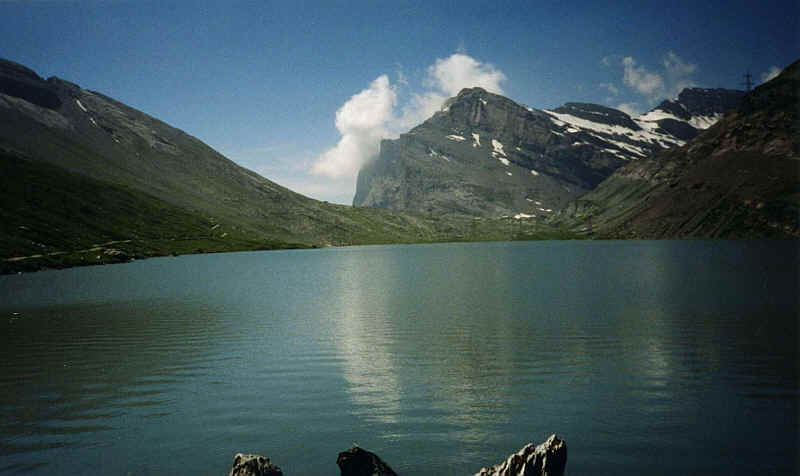 The Daubensee lake was a popular walking destination on this day, the Swiss National Day. We walked downhill past the isolated Hotel Schwarenbach through spectacular high Alpine scenery. It’s spoilt a little by a power line but the Swiss don’t worry too much where they put their pylons! 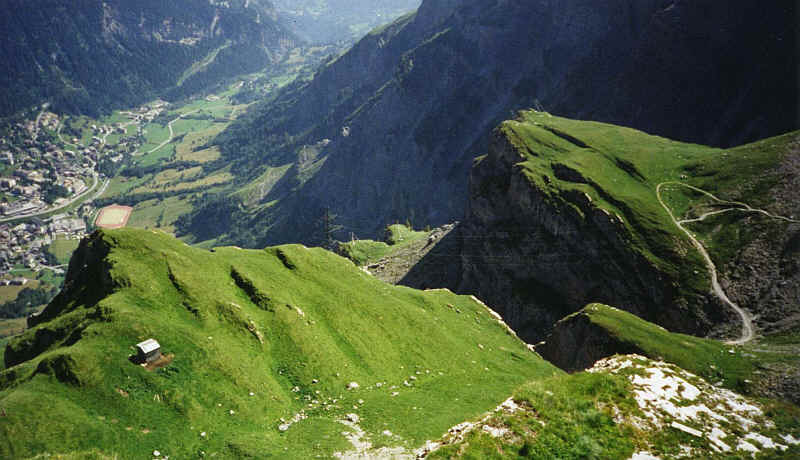 Upon reaching the more open pasture of the Spittelmatte just above the Sunnbuel cable car station we walked back up hill to the Gemmi Pass, visiting the Hotel Schwarenbach for refreshments.